Your scarf looks so cute and you're right, it really adds a great touch to your outfit :) I wish I could pull off this trend, I can't do a tiny scarf on my neck, maybe I just can't tie them or haven't found the right scarf yet! I love tying them on my bag and on my wrist though! 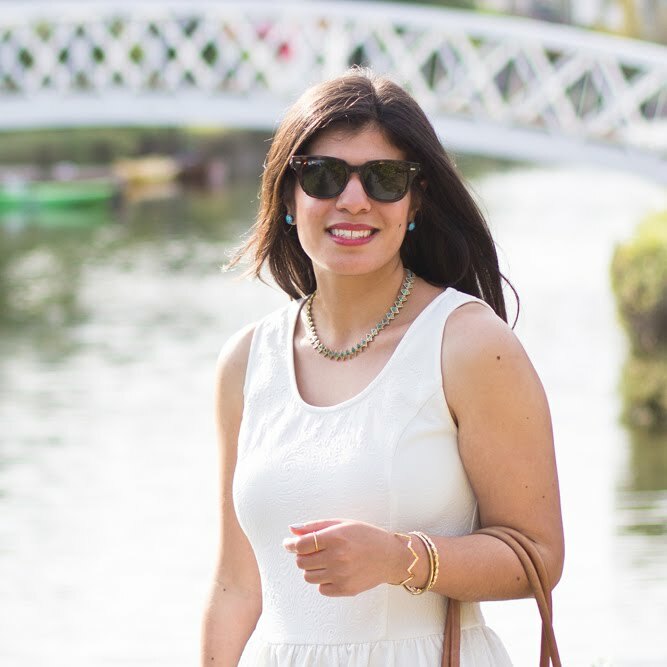 It really is amazing what a silk scarf can do for an outfit, isn't it? I literally just posted about it on instagram ;) I bought my first silk scarf when I was fifteen, out of a 2 frank bin in Montmartre - yep, it was so long ago, the euro didn't even exist yet. I had vague ideas about wearing it in my hair that never really worked out, and I'm not sure what happened to it afterwards. I've experimented with silk scarves again over the years, but only fully committed to wearing them semi-regularly recently. I mostly tie them around my neck, like you have here, or tuck them into my winter coat in place of a wool scarf when I am going to meet business clients. They really go such a long way to elevating any outfit for any occasion and personally, I am celebrating their returning wholeheartedly. But I do wear mine mostly for semi-dressed up situations, and I think I am going to have to borrow some inspiration from you next time I add one to a look. Such a perfect finishing touch for the outfit! I wish I was able to wear scarves, I just feel so weird when I am wearing them or like I'm choking, haha! A scarf is always my go-to third piece this time of year. I can't seem to stop collecting them! The scarf is the perfect addition! Love this whole look!! I love the addition of a silk scarf! they can really add so much to an outfit! Love this one! Love it! 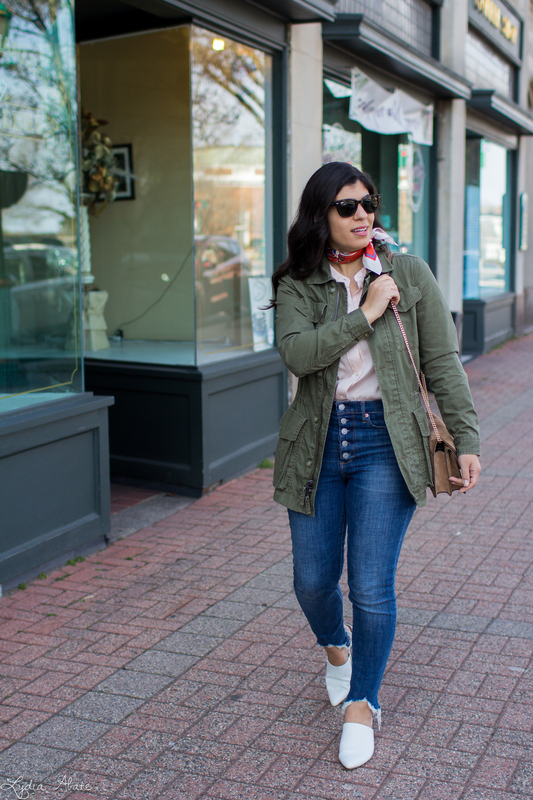 I tried the scarf trend for the first time recently and it made a simple tee look so chic! A scarf is such a classy addition to any look. It is reminiscent of the old time glam. I just adore wearing scarves like this. And putting them on my purse!! And if you have some from your grandma....how cool is that!! I'm loving the scarf trend lately! I definitely wear them in my hair frequently. It would be wonderful if you can track down her scarves and give them a second life - you are able to pull off the look quite brilliantly, after all. It makes such a difference to the look. I was mighty into them last spring. Time to give it another shot. SO stylish! Love this fun look! The scarf is the perfect accessory! I LOVE scarves on everyone but me! Although this weekend I had an outfit (traveling) that I was like I wish I had a scarf to jazz it up. This is absolutely darling! the scarf is such a nice touch, you look great. I need a jacket like that. I'm a huge fan of the scarf. It's the perfect accessory! Oh you are so right about the scarf! 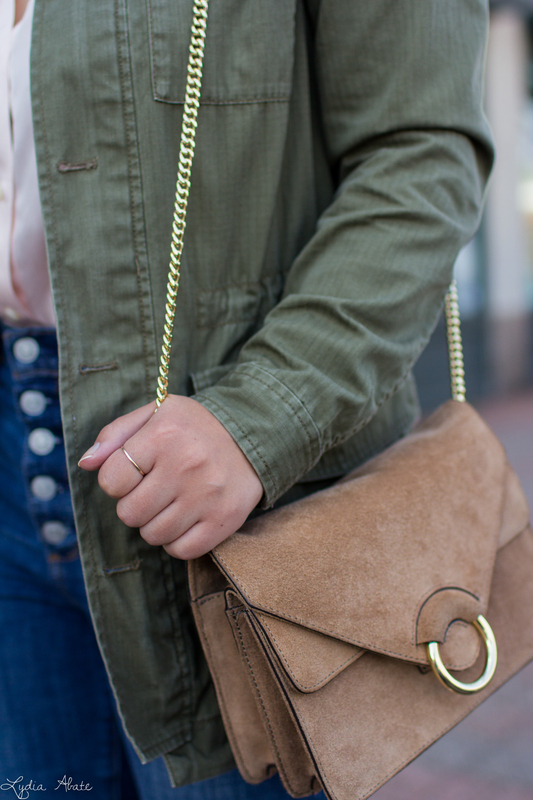 It makes this outfit chic and it's an easy little detail to add! It’s amazing how something as simple as a scarf can uplevel an outfit. Love this one on you! I love this touch- a scarf totally elevates a look! I need to break mine out! Totally agree, they instantly make any look super chic! I love how you tied this mini one. I'm totally on the scarf train these days. This outfit is SO cute! The scarf really does add the perfect touch. I always wanted to try a neck scarf -- you just inspired me to try it out! You look amaze! Love what you did with the scarf! 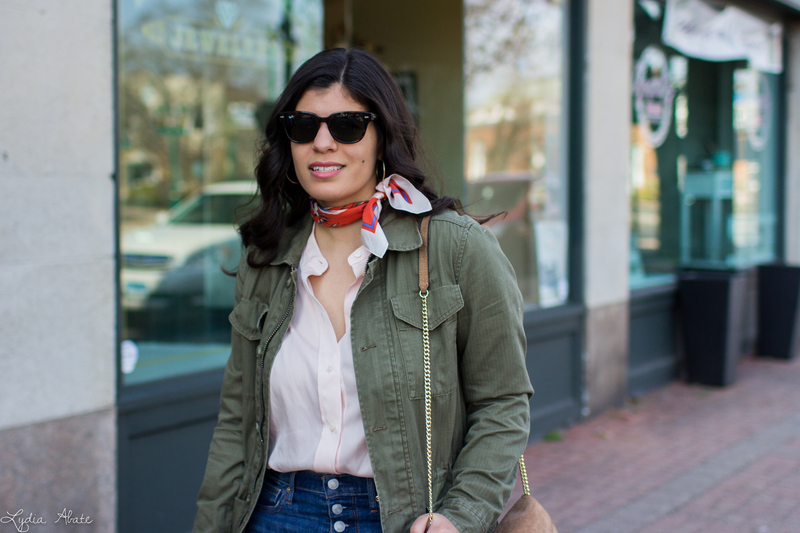 The neck scarves are for sure making a comeback and I'm with you that they elevate an outfit! Oo I bet your grandma's vintage scarves are gorgeous! Cool look. Tie a scarf on and you'll see the difference it makes in your fashion choices. I love this look! 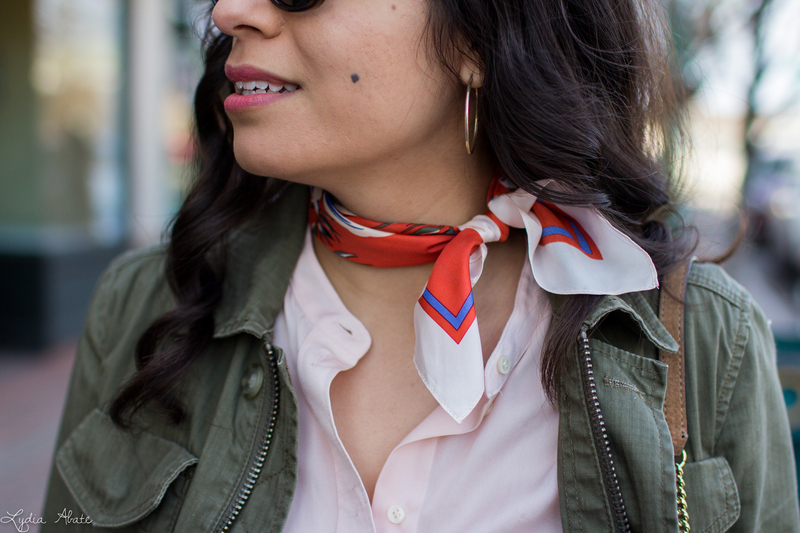 I'm a big fan of silk bandana scarves and always pack a few whenever I go somewhere. You never know when you'll need one! I love it when I see someone live or via blog that makes me want to replicate a look. I see possibilities I never imagined with stuff I own. Its so inspiring. Really like how this turned out, I would have never thought of putting these two pieces together. 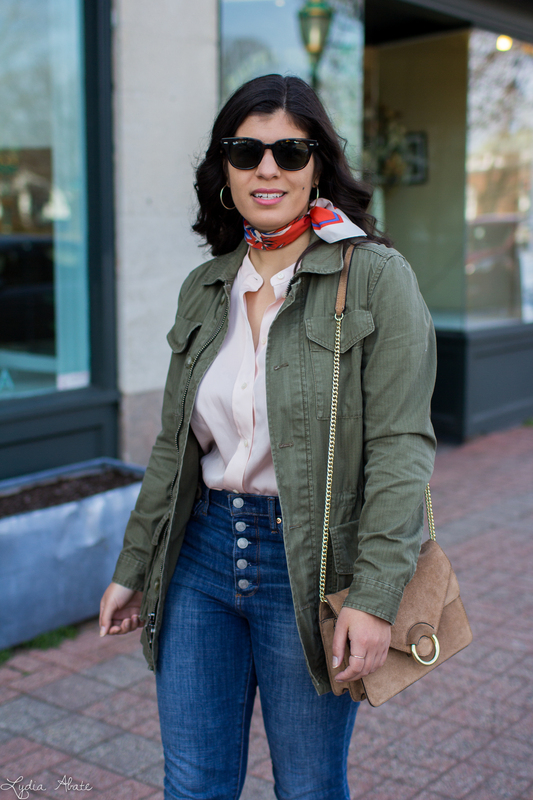 You are so right that the scarf really does elevate this look perfectly, and I love how the jeans make it feel super modern at the same time. I don't have any scarves that are the right size for wearing this way but I think I need to try to track a few down! 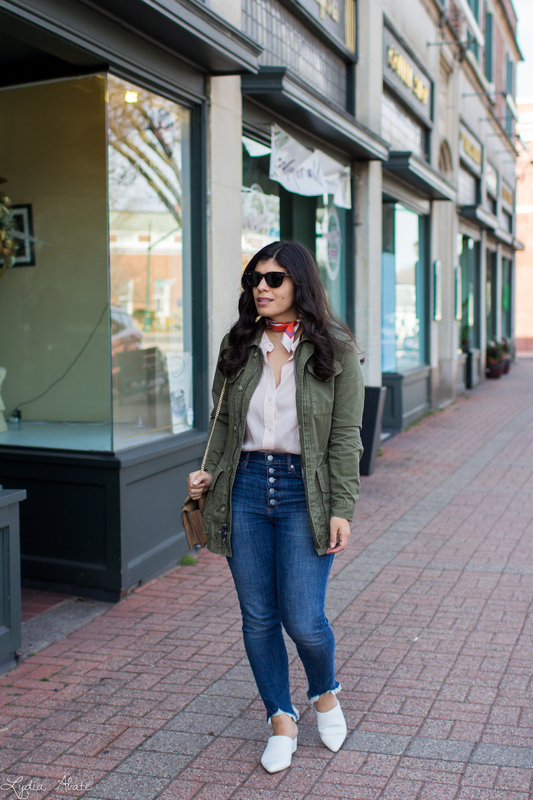 The scarf with a button-down and jeans is so classic, love it! Small scarves are such a pretty outfit upgrade!